Keep all your bathroom essentials at eye level with a wall-mounted cabinet that embodies elegance and convenience. 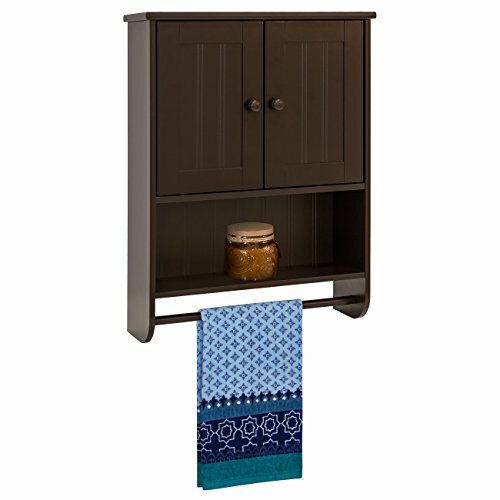 Crafted with an open shelf and a beautiful split wainscot door design that opens to an adjustable shelf, this wall fixture has ample room for storage and decor. It will also complement a variety of setups with its smooth, espresso finish. Completing your bathroom decor is just a wall cabinet away! Overall Dimensions: 18.75"(L) x 5.5"(W) x 25.5"(H); Weight Capacity: 11 lbs.